This is my tribute to those six gentlemen who have changed my life. 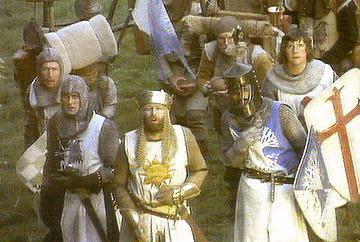 I would try to impress you with my ability to repeat every line from The Holy Grail but most people wouldn't read it so I won't bother. Through my many years of being a fan, I have been blessed with the ability to have seen every episode of the TV show and every movie they put out (including Jabberwocky). Unfortunately Comedy Central stopped airing their shows a number of years ago now, so I am left with my memories and what I can rent from Blockbuster. 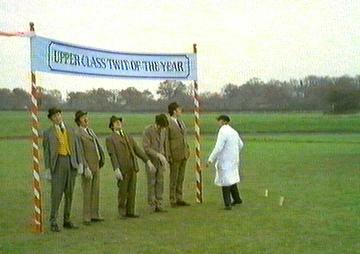 I also like all sketches/TV shows/movies involving John Cleese. He is one of my idols. I wrote my college admissions essay about him: "Name a famous person whom you admire." Because of this essay I was accepted through early admissions. He has dozens of credits to his name, another fine production of his was Faulty Towers - a sit com about a couple who owned a private hotel. 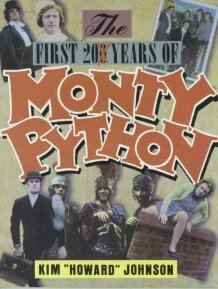 <trails off> ni I read the book entitled The First 200 [last '0' crossed out] Years of Monty Python which gave me wonderful insight into the world of Monty Python as a whole. It has episode guides, some scripts, and other interesting bits about the cast and crew. I recommend you read it too. Do you waaaant, do you waaaaaant to go back to my place, bouncy-bouncy? And, uh, get the machine that goes PING! He can leap aboot... he's got teeth like... LOOK AT THE BOOOONES! Uh, hey, I've got a great idea, why doesn't Lancelot go? Splunge, it doesn't mean yes and it doesn't mean no, and I'm not being indecisive. That's it. Now go away or I'll taunt you a second time.